This year marks the 37th edition of the Chequamegon Fat Tire Festival, which hosts more than 2,000 riders on a point-to-point course in northwestern Wisconsin. The race follows 40 miles through forest roads, snowmobile tracks, and wooded trail. However, the fast, rolling course is not especially technical and offers a fun day out for riders of just about any skill level. The start in Hayward always draws a crowd, adding to the days energy, and the fall scenery in Chequamegon-Nicolet National Forest is off the hook. 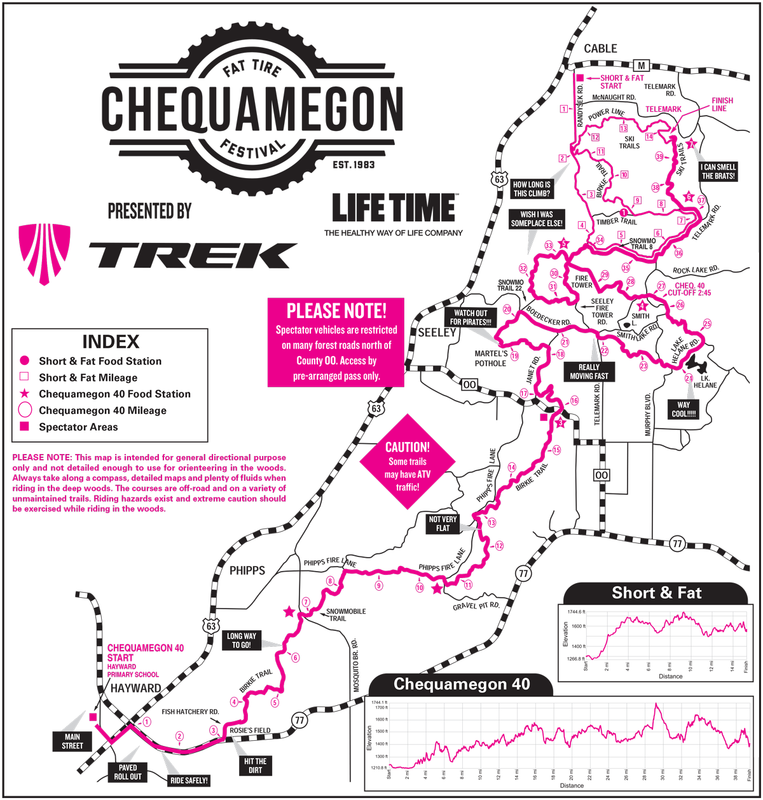 Each participant will receive a Chequamegon MTB Festival T-shirt. The Chequamegon 40 begins travels from downtown Hayward, WI over the famed American Birkebeiner Ski Trail, forest roads, snowmobile trails and other wooded paths in Sawyer and Bayfield counties to the finish line at Telemark Resort in Cable, WI. The large field size dictates that the race course have a carrying capacity suitable for the masses. Characterized as a power course, the linear nature favors the fittest and not necessarily the most technically accomplished rider. This is not to say it’s an easy 40 miles by any stretch of the imagination. The race course is long and fast, and the never ending profile fluctuations wears down even the fittest participants. The mass start of the Chequamegon 40 is spectacle unmatched in the sport. The pre-race anticipation reaches a pinnacle when the black powder cannon is fired. As the rollout heads down Hayward’s Main Street, the hum of the wheels, cheers of the crowd and shifting of gears energizes the parade start. The tempo is controlled down Main Street as the riders pass the large crowd of spectators lining both sides of the street. A left onto Railroad Street and then another right onto Highway 77 are negotiated by the anxious race field. Once on the highway, the tempo is increased as the peloton heads east on Highway 77 to Fish Hatchery Road. It is here that the riders hit the dirt and connect with the southern end of the American Birkebeiner cross-country ski trail. Following a tricky off-camber transition from the pavement into Rosie’s Field, the race is on as the fat-tired flyers make their way north to the finish line. Over the miles the off-road drama is played out one rider at a time as mind, muscles and two-wheeled machines roll up and over the unforgiving race course profile. The race-day logistics of a 40-mile, point-to-point course are significant. Aid stations, course control monitors, emergency medical staff, and evacuation vehicles for the drops and spectators are scattered from start to finish. A pivotal point in the race comes at the Seeley Fire Tower climb at 11.5 miles from the finish. Following the climb the elevation gained is lost again and the climb back to the high point on the Birkie Trail at seven miles from the finish presents yet another knockout punch. The final approach to the finish line is rewarded with a long-distance ski hill vista at Telemark Resort. Augmented by the sounds of music, the roar of the crowd and the fragrance of Wisconsin’s favorite grilled bratwurst, riders complete their long journey through Wisconsin’s North woods. Starting on Randysek Road in Cable, WI, the Short & Fat race route utilizes forest roads, the American Birkebeiner Ski Trail and other backwoods paths on the way to the finish line at Telemark Resort. The first come first served 1000 rider field limit is open to riders 12 years of age and older on race day. Young and old alike line up on Cable’s Randysek Road for the 10:00 a.m. start. The excitement peaks as the gun sounds and the motor paced rollout moves downhill swiftly crossing the Namakagon, a National Wild and Scenic River. After about a mile of pavement, the trail tread turns to dirt and gravel, grass and sand with a bit of mud thrown in for good measure. The course profile levels and then begins an arduous four-mile climb that sorts out the race field. The long tiered climb draws the peloton out as the leaders make their first breaks, the chasers try to bridge the gap and the others just try to survive. At Camp 38 Road the race shares a portion of the Chequamegon 40 course, whose riders will pass after the Short & Fat racers are through. Camp 38 Road and Telemark Road that follow present an exciting three-mile, mostly downhill section and a bit of relief. When the route turns back onto Timber Trail, the riders head west to tackle the rolling profile of the American Birkebeiner cross-country ski trail. The undulating hills in this section will test muscle, machine and mind as the miles to the finish tick off one at a time. Following the Birkie trail roller coaster ride, the track narrows at the power line as the racers enter the Telemark Resort ski trail system. The final three miles to the finish line approach offer a fun, flowing ribbon of dirt. Once the gravel Nordmor Road behind Telemark Lodge is encountered, a long climb followed by a quick descent leads to the last long climb up the Christie Bowl on the back side of the Telemark ski area. The last half mile to the finish line is a rush as the riders try to beat the clock. The event will be held in Hayward, WI 54843. Parking Lot - Fifth St & Wisconsin Ave.
First Lutheran Church lot – Nyman Ave near Main St. Overall Awards: Top 3 men and women in the Short & Fat will be recognized and receive an award. Single Speed: Top 3 overall males and females receive an award. Fat Bike: Top 3 overall males and females receive an award. Tandem: Top 3 overall teams receive an award. How was Chequamegon Fat Tire Festival?